TVs and monitors are among the most essential consumer electronics around, as they’re used extensively in homes, offices, and all sorts of business establishments around the world. As such, it’s not surprising to see a bunch of new display panels come out year after year. 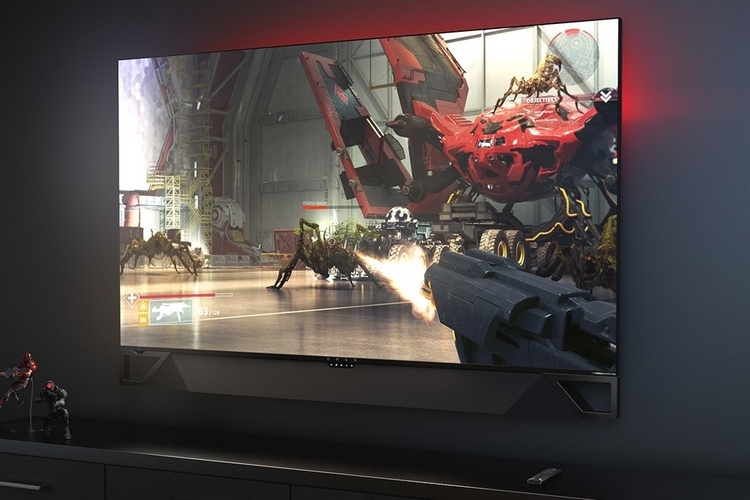 If you’re among those who prefer buying the cutting edge in tech, these are the products you’ll definitely want to look for when shopping for TVs and monitors in the coming months. While Vizio is no stranger to high-end TVs, they built their name on affordable panels that performed on par with their more expensive counterparts. And they’re not abandoning that strategy for the year, as their 2019 M-Series continues the line’s tradition of combining mid-range pricing with premium technology. 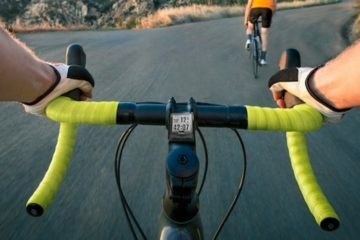 As such, the new M-Series retains the same standout elements from last year, such as a bezel-free design, 4K HDR, Dolby Vision, Ultrabright 600, image stabilization, and 120Hz refresh rate, all while adding the Quantum Color technology that was previously only available in the outfit’s flagship panels. The new line is available in 55-, 65-, and 70-inch sizes. Touted as “the world’s most cinematic TV,” the GZ2000 4K OLED TV supports not just HDR10+ and Dolby Vision HDR, but also HLG Photo, making it an excellent panel for displaying still photographs, in case you like to use your TV as an occasional picture frame. 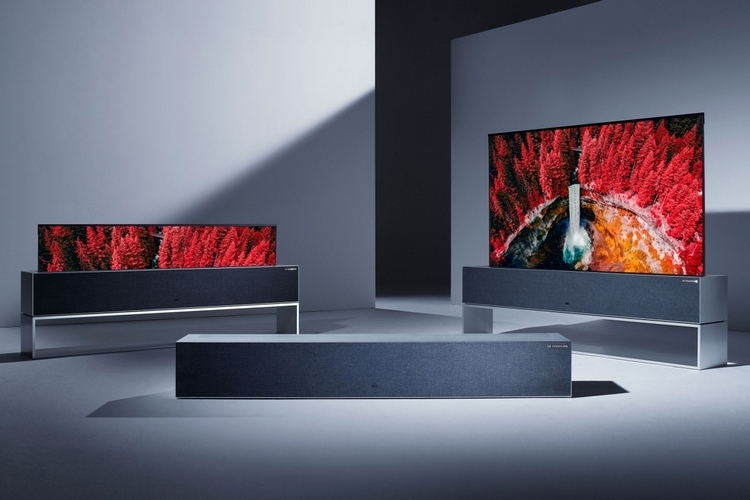 It uses a professional-edition 4K OLED panel that’s received bespoke hardware improvements from Panasonic’s R&D engineers, all while receiving custom color-tuning by renowned Hollywood colorist, Stefan Sonnefeld. They pair that panel with upward-firing speakers that have been custom-tuned by Technics engineers, ensuring it delivers an immersive experience on both the visual and sonic fronts. A TV fit for the most lavish New York apartment, it’s the world’s first (maybe only) rollable TV, allowing it to roll up and hide away in the base cabinet when not in use. Seriously, you end up with nothing but a table in its place (well, it looks more like a wide-profile speaker, with its metal body and wool grille), allowing you to put another TV on top, in case you prefer watching on something else for a change. We know, that sounds ridiculous, but you already own the most ridiculous TV there is, so why not? And yes, you can make the TV rise up or roll back down using voice commands via Alexa or Google Assistant, so it’s as convenient as it gets. Okay, we don’t actually know whether this one’s coming out this year. If it does, though, then the Samsung MicroLED will definitely count as one of the most exciting product releases in the category. What exactly is it? According to the company, it combines the best parts of OLED and LCD panels, allowing it to deliver perfect blacks, pinpoint contrast control, greater brightness, and more efficient operation. Oh yeah, it’s also modular, allowing you to combine multiple panels to display a single picture (e.g. 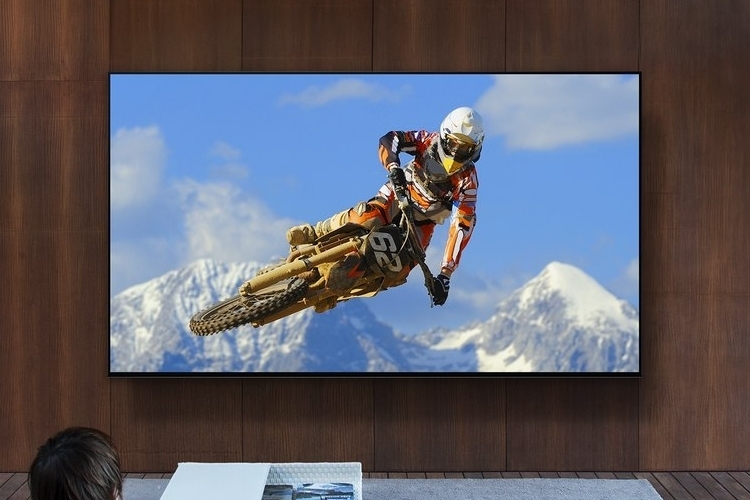 use four 75-inch TVs to create one gigantic 150-inch panel). 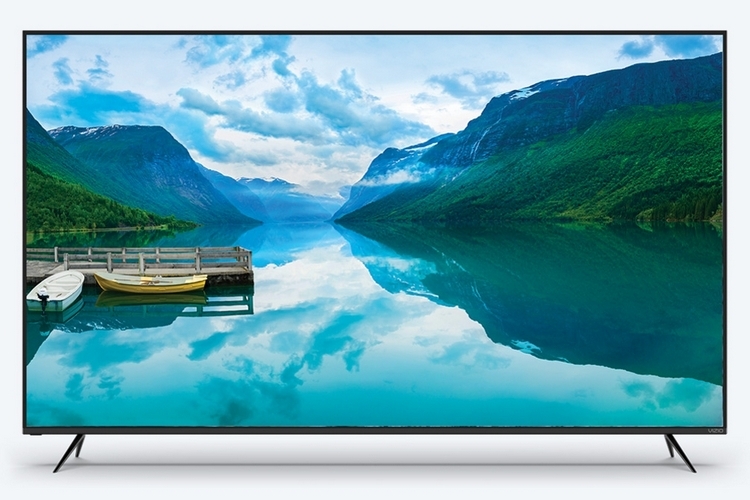 Sony’s newest TV flagship, the Master Series Z9G brings 8K to the masses, ensuring your home TV is adequately equipped to watch 8K content, whenever that comes. Seriously, is there even anything on 8K that you can watch natively on this thing right now? Aside from having four times the resolution of your puny 4K TV, the panel boasts direct LED backlighting, an advanced new upscaling engine to turn those ugly 4K content into glorious 8K, and even a Netflix Calibrated Mode that supposedly allows you to enjoy Netflix originals on the TV the same way you would on a studio evaluation master. It’s available in 88- and 95-inch sizes. Instead of being set down on your desk, Samsung’s new desktop monitor is designed to be clamp to the edge of the table, allowing it to use up minimal space, so you can put more gear on your desk. The arm holding the screen can be tilted to let you position the screen at a wide variety of angles, while recessed grooves on the same arm allow you to hide the power and HDMI cables, ensuring you can maintain a clutter-free workspace. It comes in two sizes, 27 inches (QHD resolution) and 32 inches (4K resolution), both of them coming with no bezels on the top and sides for a really sleek look. 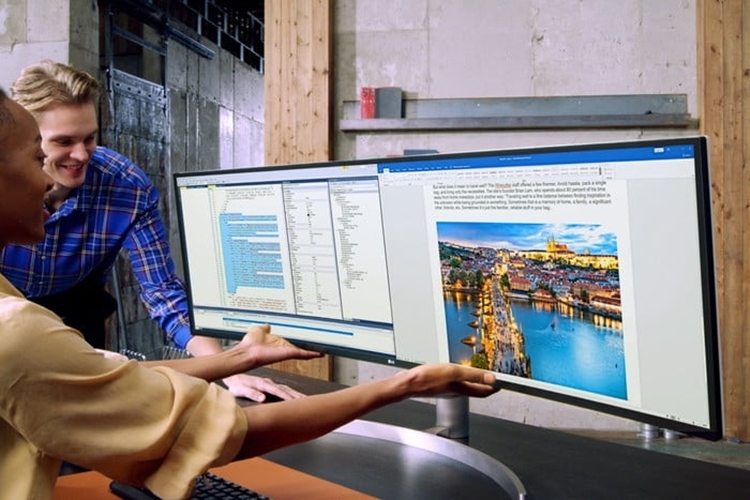 Billed as a “productivity-boosting tool,” LG’s 49-inch curved monitor comes with a 32:9 aspect ratio, allowing it to serve as a functional replacement for dual-screen setups, with its 5120 x 1440 resolution effectively providing users the same amount of pixels as two 27-inch quad-HD displays. 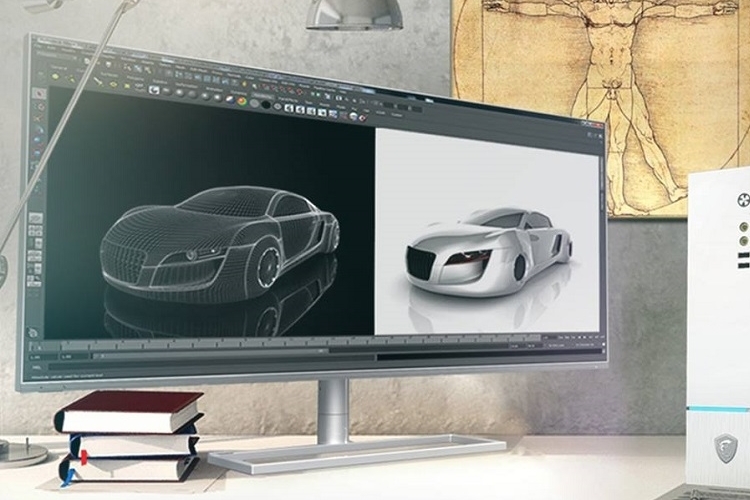 Aside from the generous ultrawide profile, the IPS panel also boasts the ability to display 99 percent of the sRGB color space, HDR10 support, and compatibility with LG’s Dual Controller software, so you can use the same peripherals (mouse, keyboard, and monitor) with multiple PCs in a coordinated manner. 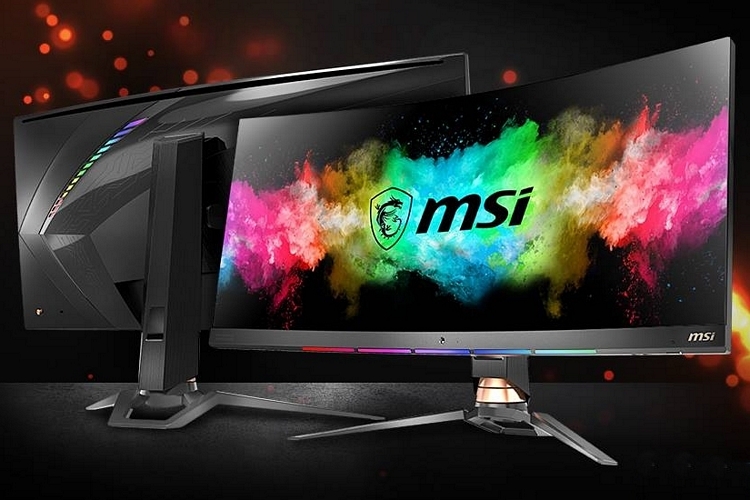 Designed specifically for content creators, MSI’s 34-inch monitor comes with a 5120 x 2160 resolution and a 21:9 aspect ratio, making it perfectly suited for working on videos, graphics, and animations, but with a 60Hz refresh rate, it’s totally underpowered for gaming, so you won’t be tempted to fire up a game of Black Ops V. Well, maybe you still will, but wouldn’t you rather be gaming on a 120Hz display? It comes out in June. 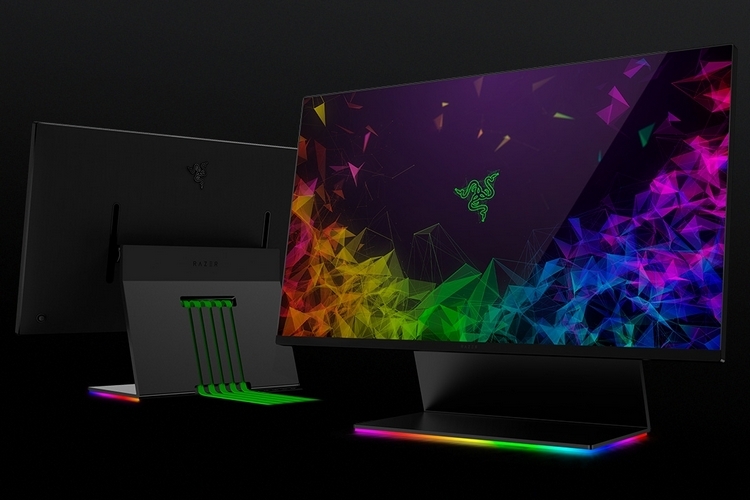 Razer’s first gaming monitor gives users a 27-inch IPS panel with a 2560 x 1440 resolution, a 144Hz refresh rate, and a one millisecond response time, so this should support most of your gaming needs, unless you prefer staring at 4K graphics. Other features include 420 nits of brightness, 95 percent coverage of the DCI-P3 color gamut, and support for a few vital display technologies out there (HDR400 and AMD’s FreeSync 2, with Nvidia G-Sync currently in the works). Like other Razer products, this looks sleek, with machined aluminum for the frame, base, and stand, all while getting subtle Chroma integration right beneath the base, so the lights won’t affect your gameplay whatsoever. Ever wished you can play PC games on a giant screen like people do on a console without sacrificing the high refresh rates and response times that you’re used to? Now you can with the first Big Format Gaming Display (BFGD) in the market. Called the HP Omen X 65 Emperium, this 65-inch beast boasts 4K UHD resolution, a 144Hz refresh rate, 4-millisecond response time, and Nvidia G-Sync support, ensuring it will display your most graphic-heavy games in their full glory. Blurring the line between TVs and monitors, it can be fitted with an integrated soundbar that packs three stereo amps at 120 watts, all while coming with a Nvidia Shield built-in for native access to Android apps and the Google Assistant. While it looks like just another curved gaming monitor, MSI’s new 34-inch Optix model brings something fresh to gamers – the ability to control in-game action using voice commands. Sadly, it won’t be with every game. Instead, it will only be for games that have intentionally been made compatible with the system, so MSI should have some work cut out trying to get developers onboard. 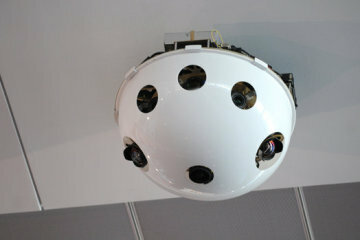 There’s also a camera along with the mic, both of which the monitor will use for its built-in virtual assistant (no word on which one it’s using). As for the monitor itself, it comes with a 3440 x 1440 resolution, a 21:9 aspect ratio, a 144Hz refresh rate, and a 1 millisecond response time, along with a camera mount on top for streamers. 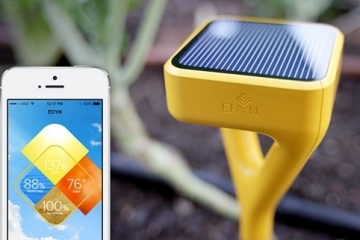 It launches in June, priced at $899. 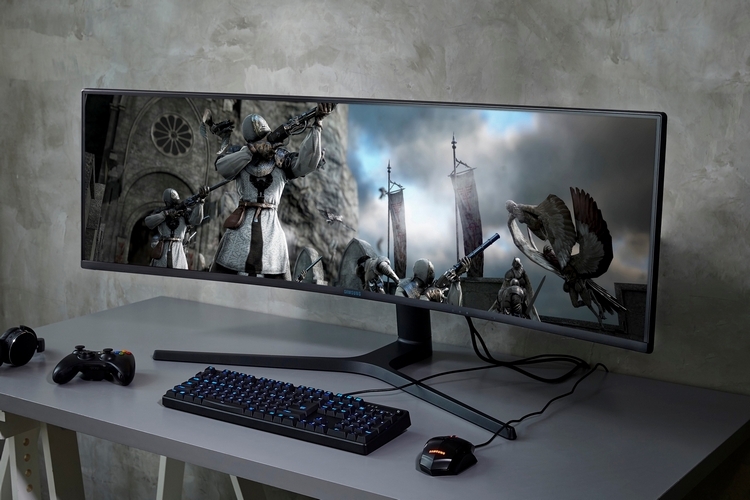 Bought one of Samsung’s curved 49-inch CHG90 monitors when it launched last year? 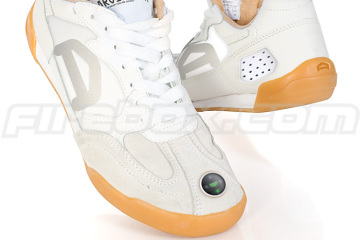 Well, prepare to want to upgrade this year, as the outfit is releasing a worthy successor that brings considerably higher resolution and brightness. Called the CRG9, the 49-inch curved gaming monitor brings a 5120 x 1440 resolution in a 32:9 aspect ratio, along with 1000 nits of peak brightness, 178 degree viewing angle (both vertical and horizontal), a 120Hz refresh rate, and 4-millisecond response time. It supports both AMD FreeSync 2 and HDR10, so expect excellent contrast and color accuracy even in the most fast-paced action moments. Don’t care much for curved and ultrawide panels? 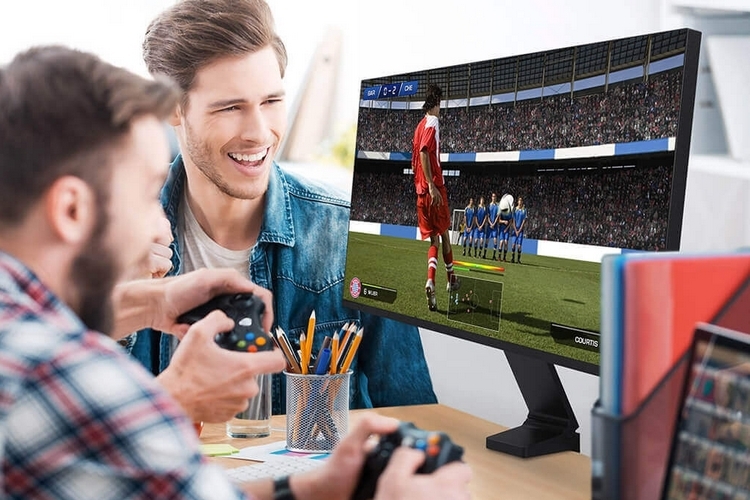 Lenovo has something right up your alley – a 27-inch monitor that delivers 1440p resolution at an insane refresh rate of 240Hz. Yes, that’s not a typo, making it the first monitor in the market to have this resolution and refresh rate combination. It also boasts 90 percent coverage of the DCI P3 color gamut, a sub-millisecond response time, and Nvidia G-Sync support, so it has all the gaming basics handled just fine. The Legion Y27gq launches in April, priced at $1,000. The Panasonic GZ2000 TV looks so good! I’ve been wanting a 4K tv for a couple years now and this one might make me take the jump. I’m just disappointed with the lack of 4K channels. My husband is a movie buff so he’ll appreciate a 4K much more than I. There are more 4K videos on Youtube than any other provider. The problem is most Internet cannot stream it efficiently. I have to download 4K in order to watch it. I rarely watch in 4K as it is just not worth the hassle. If I had fast fiber Internet and didn’t get throttled it would be worth it though. I’d suggest just buying a cheaper 4K model off of Amazon as more than likely it will be more than you need. We have a 4K television and never use the 4K. I was excited to get 4K for the nature docs on Youtube, but as you said, we are stuck with crappy Internet that won’t allow me to stream in full 4K. I got Youtube Red, so I can download 4K videos and watch them without streaming, but it is too much hassle. 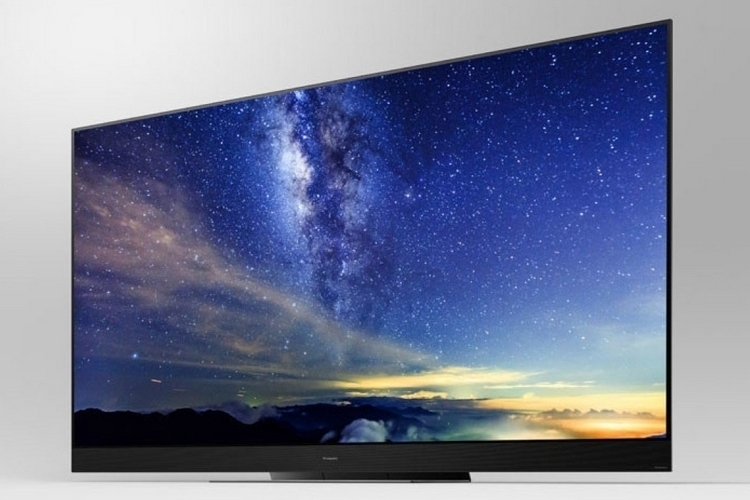 Even at just 1080 HD, the newest televisions will look amazing. 4K can’t fully catch-on until more people have access to fast fiber internet. The price of 4K TVs is cheap too, at least for the entry level models. Amazon has a lot of value priced 4K TVs for cheap. We stream a lot in just 1080, but we download 4K videos to watch too. You can definitely notice an increase in quality with the 4K compared to the 1080 HD setting. 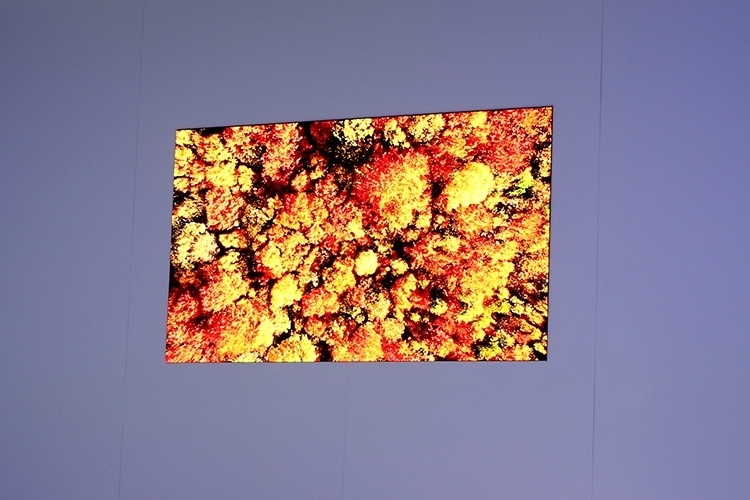 With 8K TVs starting to hit stores, 4K will be even cheaper pretty soon. Youtube does have a lot of 4K videos, but some of them were not rendered properly so it is not true 4K, but still looks really good. The best news is a top of the line television today will be discounted down next year! The problem with Vizio is that they are being sued under a class-action lawsuit over secretly tracking the users of the tv. I don’t want tv manufacturers to be tracing me. Their profits should be solely from making and selling TVs and not from selling data collected about my viewing habits. The class-action will grant everybody affected approximately $1. Yep just one single dollar, and that is before attorney fees. After attorney fees, each user of an affected Vizio smart television will be granted 50 cents if they are lucky. Vizio made a lot more in income from covertly tracking their users illegally then they will have to payout. We are rewarding companies for doing bad things. Vizio doesn’t really care if it has to pay out 17 million because they made much more than that off of selling the data that they collected illegally. It’s easy for consumers, as well as myself, to write of televisions such as the Panasonic GZ2000 as unneeded. My current large screen high-definition tv is more than enough. I can play 4K and it looks amazing. The problem is when I get to see a high-end tv like the Panasonic GZ2000 and I realize how far the quality of high-end televisions has increased over the past couple of years. The custom color tuning is a nice added feature. I struggle with my blues and purples so when I try to set up a television or monitor coloring I will get it to look right to me, but when other people look at it they see it all jacked up. I would love to get an HD OLED TV, but I will probably not buy Vizio as that company cannot be trusted. 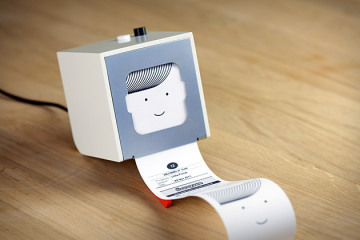 I think the roll-up TV is really neat, but I have absolutely no use for it. A rolling-up TV is definitely a feature I wouldn’t be paying extra for. Combing 4 of the Samsung 75-Inch MicroLED TV to have a 150” television would be a visual spectacle that would leave me drooling, unfortunately, my house os too small for as well as my budget. How long will an OLED and LCD panel combined last? When OLED first came out they had a shorter lifespan but now they can hit 100,000 hours with no problem. I do think the 8K televisions are interesting. It is good we have them I guess, but is there any 8K media on DVD or downloadable yet? I have a 4K TV and we stream everything but I cannot stream 4K because of poor internet. I can’t imagine 8K taking off yet since a lot of consumers are like me and cannot fully utilize their 4K TVs with streaming. The Samsung Space Monitor is a great idea. I love how it clamps to the end of the desk. This simple feature should be more common as it allows you to use more of your desk without the monitor hogging up all the space. 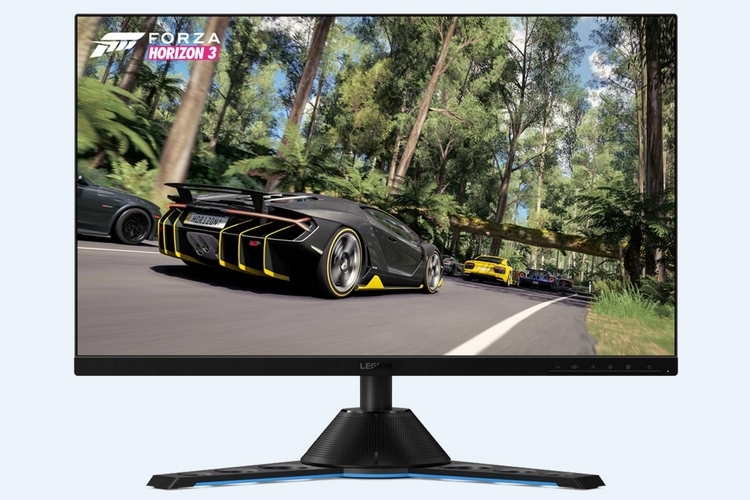 I don’t have a desktop computer anymore or the space to plug in to my laptop, but the LG 49WL95 Ultrawide 49-Inch Monitor would be so perfect for work. I have a bunch of wires connecting two additional screens, my internet, my mouse and my power source with no dock. It’s annoying as can be whenever I have to unplug for a meeting. This monitor would cut down on my chords and provide even more screen than I have now without being cut 3 ways. 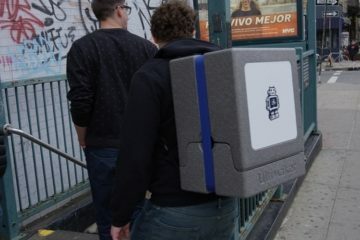 I wish my work could get me one. Remember when every town had a TV repair shop? Even small po-dunk towns in the middle of nowhere with just a few hundred people had a television repairman. Now they are dispoasble. I have always been concerned with the life-span of the bulbs used in the HD TV’s, but I have nt yet had one fail, even though we often leave the televion on all night and even during the day when we are gone to help keep out dog cam and entertained. The new flat panel HD TV’s never seem to break down on me. If it did, I would have no idea where to find a TV repairman.